There are three types of people in the world: The Sheep, The Sheepdogs and The Wolves. – dun dun dun – the wolves attack. The wolves are all around us. Some of them are obvious, like the criminals we see in the news each day. Some of them are not as obvious; they often occupy leadership positions in business, government, education and religion. The wolves are out to steal, kill and destroy. The wolves are on the prowl for the weak sheep, those who have fallen away from the herd, those who are scared, those suffering from an injury. 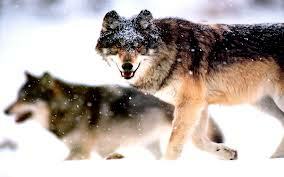 The wolves are out to fulfill their own needs and care nothing for the sheep. The sheepdogs have a mission…protect the sheep from the wolves (and sometimes from the sheep themselves)! The sheepdogs round up the sheep, promoting unity. This makes it much harder for the wolves to attack (the wolves like wounded and solitary sheep because at heart, the wolves are cowards). The sheepdogs often bark in warning to keep the sheep together. The sheepdogs sometimes have to inflict pain through a nip on the legs of the sheep. When compared to being eaten by wolves, this pain is minimal but necessary. The sheepdogs often seem to be all alone. 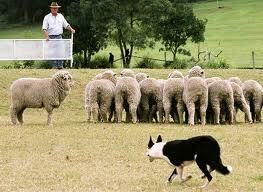 Like the wolves, you can find many sheepdogs in leadership positions in business, government, education and religion. 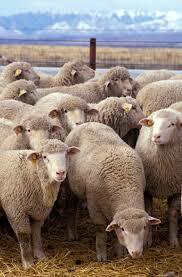 However, some of these people should be sheepdogs, but are actually sheep being controlled by the wolves. These can be more dangerous than the wolves. But…something strange happens in this scenario…Even though the lives of the sheep are dependent upon the sheepdogs, the sheep often hate the sheepdogs. Some sheepdogs look like wolves; they have sharp teeth and claws and are always barking, but it’s to protect the sheep! The sheepdogs often get into terrible fights with the wolves to protect the sheep. Over them all is the Good Shepherd, Jesus. 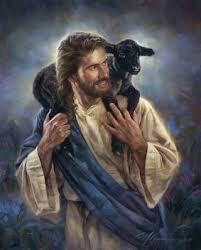 He gave His life for the sheep. Many of them hate Him too. Many of them reject Him. He made the sheepdogs. He gave the sheepdogs their mission because He cares for the sheep even more than the sheepdogs do. Are you a sheep, a sheepdog or a wolf? Maybe you’re a sheep controlled by a wolf? Have you met the Shepherd? The Good Shepherd warned us that the wolves often come to us in sheep’s clothing.